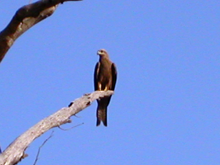 A black kite (Milvus migrans), a species of hawk. It has recently been discovered that high-status mated pairs of black kites "decorate" their nests using bits of plastic. (See Brandon Keim's article, "Hidden Messages Found in Bird Nest Decorations," at wired.com.) A few bird species had been known to use decoration as a mate attraction tactic, but this recently discovered behavior is different. Although the decorations don't contribute much to nest structure, they do seem to be used to communicate pair fitness. Analogously, although some embolalia do serve purposes related to the content of the speech — such as giving the addressor time to formulate content and delivery — many seem also to be "decorative." That is, they communicate power or status rather than content-related information. For example, a phrase such as "Many people do subscribe to that thesis, but there is little hard data to support it. Let me explain" is probably longer than needed if collecting one's thoughts is the purpose. Decorative embolalia could be serving a more useful purpose, such as status assertion or differentiation. Photo courtesy U.S. National Aeronautics and Space Administration. In last week's issue, we began an exploration of embolalia — the filler we use in everyday speech, to help us gain time to gather our thoughts, or to soften our tone. We focused on the simplest forms — "uh," "um," "er," and so on, and short phrases such as "kind of" and "stuff like that." This time we turn our attention to forms of embolalia so complex that we don't recognize them as filler, even though they contribute nothing to the speaker's message. The simplest of these are introductory embolalia, which tend to appear at the beginning of the address. They include "actually," "basically," "anyway," "honestly," "seriously," and "well." President Reagan was known for his use of "well." Some of these also have a softening effect, but they convey other messages, too. For instance, "actually," can be condescending, "seriously" can close a humorous interlude, and "anyway" can be a means of rejecting contradiction. Many people do subscribe to that thesis, but there is little hard data to support it. Let me explain. Would you like to see your comments posted here? rbrenyIdtSpeoiPhTFCtSner@ChacyJwjjjObehFZSONyoCanyon.comSend me your comments by email, or by Web form. I offer email and telephone coaching at both corporate and individual rates. Contact Rick for details at rbrenwWZYgalEppNItKIdner@ChacmKEymLsbfRDdLXXOoCanyon.com or (650) 787-6475, or toll-free in the continental US at (866) 378-5470.